I know I just posted a layout yesterday, but I just finished my layout for today, and I had to share it. The prompt was I Miss…, so I immediately thought of my Dad who died of colon cancer 13+ years ago. I have never scrapbooked about my Dad before It just seemed too overwhelming. So, I just started writing. I went with the first things that came to mind. I can always do other layouts, right? Have you scrapped about someone you miss? 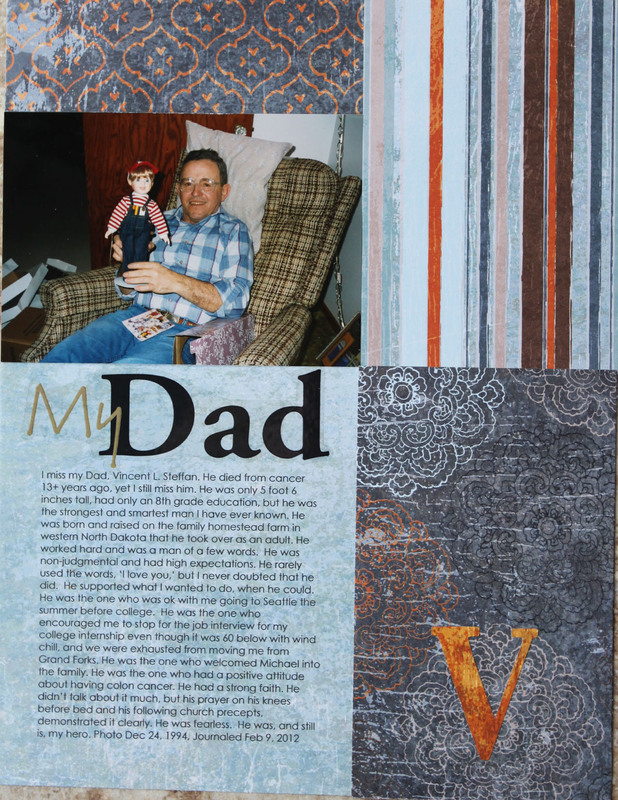 This entry was posted in Family Life, My Layouts by Karen Grosz. Bookmark the permalink. I miss him too. That was spot on. Loved reading it. Thanks for sharing. Oh Grandpa, don’t we all miss him. So true your writing was! That recliner and that farmer boy brings back so many memories! The recliner almost looks funny with out the orange stripped afgan that was always there except for special occassions. Glad it brought be memories. I was thinking the same thing about that afgan. I haven’t seen that “easy chair” in a long time. When I first saw the photo, though familiar it almost looked strange. Then I realized that afgan was missing. Wonder if Mom still has it. I really don’t know if she still has the afgan. I don’t think so, I think it ws getting ratty.